Sabudana is sago pearls and it is a popular fasting food during navaratri. Sabudana khichdi and sabudana kheer are as popular as sabudana papad. This sabudana vada is another way to feast during the fasting season. This time I made this sabudana vada with chopped onions as it was for a tea time snack on a weekend a couple of months ago when the heat was not this deadly. Now a days it is mango shake or aam malai or lassi everyday for evening snacking that sometimes becomes dinner. Dinner can be skipped at my place if we had a heavy evening snack, but not the evening snacking ever. Well, mostly it is like this. Sabudana vada is a high carb (high glycemic index too) dish and you have to be conscious of the fact that you are having a carb- fat combination so it is advisable to have a lot of green chutney with it. Adding sesame or peanuts or both lowers down the glycemic index and I sometimes add onions for the same reason. Once in a while it can be enjoyed with self control. Yes you need that in enormous amounts as this vada is very very addictive. Control your portion size or walk some more, do whatever it takes but never miss the opportunity to enjoy good food. Just do not binge on it. *sago has to be soaked in enough water to just cover the surface in a wide bowl, 3-4 hours is enough normally but it should be tested by pressing one sago pearl between your finger tips and it should give in to pressure and should get mashed when applied pressure. I keep the soaked sago in the fridge and it works very well for the vada as well as sabudana khichri, that is the pearls remain intact and cooks well to become translucent. 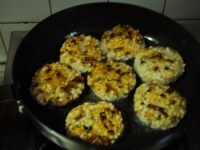 In these vadas the sago on the surface becomes crisp by frying and those in the middle are soft and translucent. For me it is the best vada with my chai. I need just one with my chai as I am finicky that the chai should not be 'disturbed' with too much snacking (still I manage to binge on this vada and that is why I warned you). 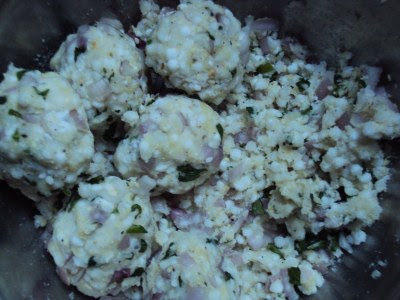 It is essentially a vrat ka khana as sago is not a cereal and during fasting it is made without onions and with sendha namak (rock salt), so during fasting it is enjoyed with a meal but otherwise it should be an occasional snack. Onions provide a different dimension to the vada and sesame makes it even more crunchy on the outside.You might like this version more than original may be. I keep alternating between the original recipe and this one. .
Sangeeta, they look just great !!! Wonderful coloring of the final vadas. love love sabudana vada..:-) yours making me hungry! good morning.Nice version of the vada with onions and sesame,I know u have cautioned but I can still binge on it. I love sabu dana Badas and the sprouts also getting on my nerve . I must do some thing fast. @Prani....it's not at all time taking nis very easy once you have your sago soaked well , if you find your sago vada splattering in the oil it means the sago is not of good quality ( i have experienced it a few years back ). The test for good quality sago is to boil it in plenty of water .if the sage remains whole n gets translucent it is good sago n if it disintegrates making a slurry it is not goo...and discard it. BTW i shared this tip just because i have had only this difficulty with sago vada in the past ....if you have any other query you are welcome....it is an easy n quick thing to make otherwise. 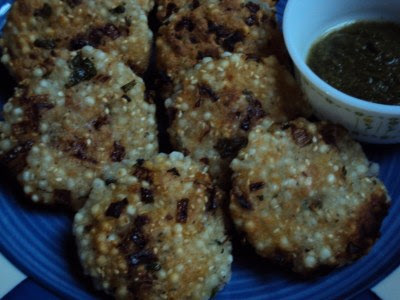 honestly i have agreed to fast on a few days just coz then i would get to eat these delicious vadas :) looks so tempting. 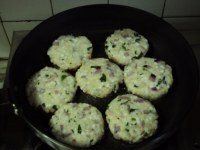 i made sabudana vadas couple of weeks back. 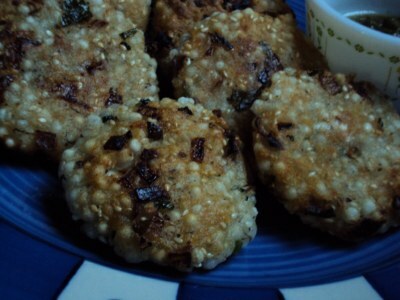 The sabudana i have is not of good quality, so it was all very mushy, nevertheless i added some tapioca flour and the resulting vadas were very good, and not particularly oily as well. 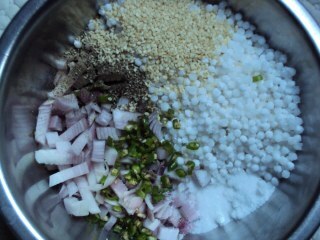 Also ive never added sesame seeds, usually i add a cup full of roasted, & crushed peanuts, the maharashtrian style! I have used besan successfully to bind it whenever it happened to me in my earlier attempts , though it will not be suitable for fasting. @ Amrita.....come on make this one more time , Rajani's tip will be very handy for many. Simply loved the look if the Sabudana Vada that you have prepared. Adding sesame seeds was an unique step and in the next time I too would prepare in the same way.Lovely space... Following you dear. Love the idea of shallow frying the vadas they look tempting and yum. Crispy and tasty perfect with a cup of tea. This was one recipe i was hunting for a long time. Traditionally oriyas are not too fond of fried stuff and hence did not get too many receipes from either my mom or mom-in-law. Will surely be back on this one. um-um... have never tried making sabudana vadas, but khichri... when I make sabudana khichdi, it sticks to the surface of kadhai :-(, any suggestion what I might be doing wrong... I soak it overnight in just enough water to cover it. I will post a step by step version of sabudana khichri very soon. A-ha. I knew I'd seen it--love the idea of adding til--i've never done that and will be trying it tonight! thanks for the recipe! I love sabudana vada but just cannot get it right.